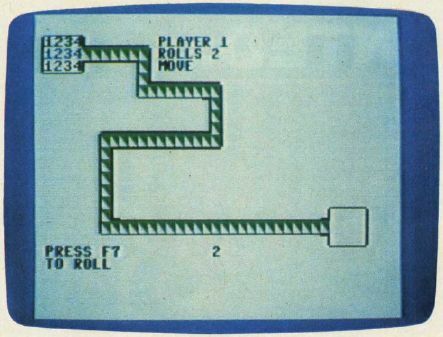 "Pathway" is not a typical computer game. The computer is not an opponent – it simply keeps track of the game you play against another person. For VIC, 64, and Apple. The rules of the game are simple, but there are a few catches. Each player (two or three can play) starts off with four tokens at the start of a path. The first player to get all four tokens to the end of the path is the winner. To play, push the VIC's F7 key. The machine will return the number of spaces you can move. Each token is numbered 1, 2, 3, or 4. Press the appropriate number key for the token you want moved. If your token lands on another player's token, that token is sent back to the start of the path. If you land on your own token, that token becomes invisible until it is moved. As you play, you'll see that a wise strategy is required to win. 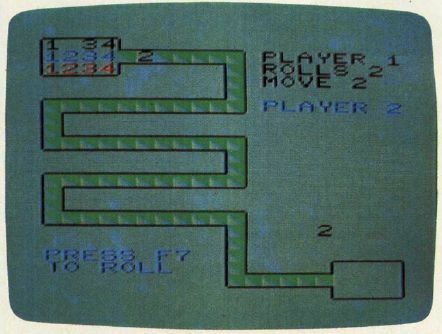 The VIC version is written for the unmodified VIC, so disconnect any extra memory (except for the Super Expander). The positions of the tokens are stored in arrays and updated as the tokens are moved. Once a move is made, the arrays are compared to see if a token should be sent back to the start. The position of a token is a number which represents how many cells away the token is located from the start of the path. Each cell corresponds to a certain screen location, all of which are stored in DATA statements. For example, if a token were moved from cell 24 to cell 31, the machine would read the DATA from the start and put a path character in position 24 to erase the token. It would then return to the start of DATA and read to the thirty-first location, where the token is then printed to the screen. The 64 version is almost identical in play to the VIC version, although the playing field is larger. The Apple version uses the space bar instead of the F7 key used by the Commodore versions. Player 2 is about to roll the dice in the VIC version of "Pathway." 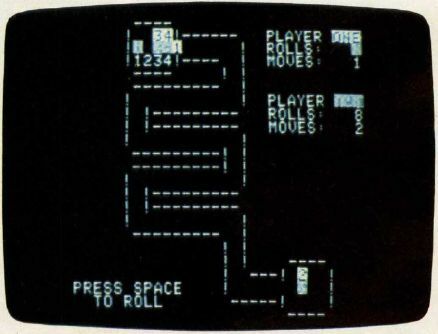 Two game pieces have successfully traversed the maze in the Apple version of "Pathway."